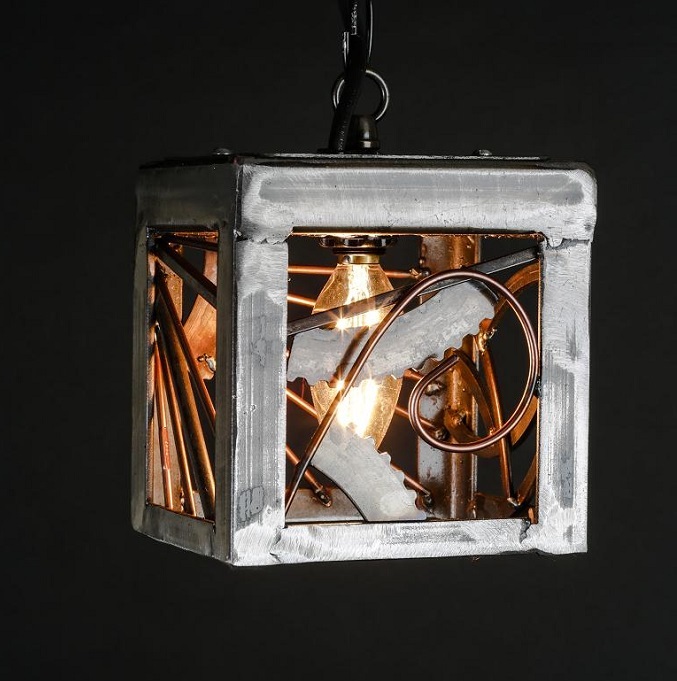 Our best selling pendant light is made from automatic transmission clutch plates we salvage from local transmission shops. The Flower pendant light is made from 55 gallon oil drums sourced from the local sawmill mill. Each petal is hand cut and painted. 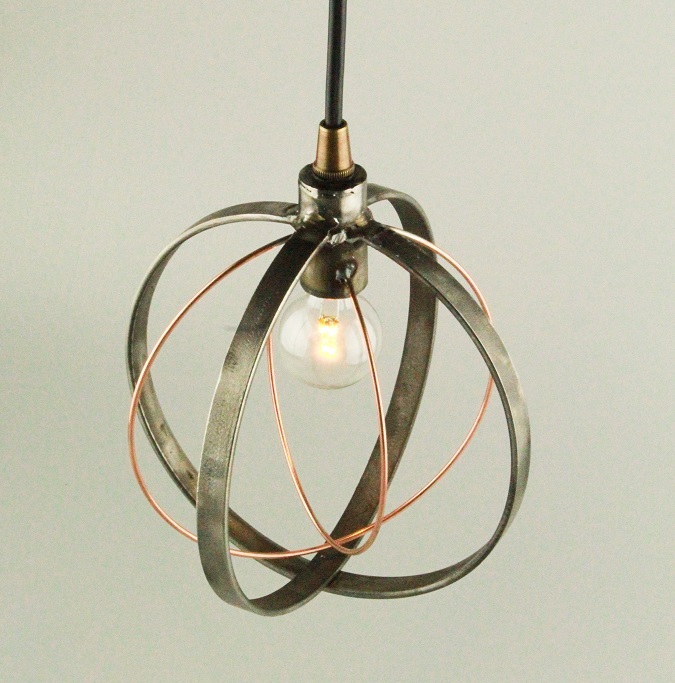 The Hemispherical pendant light is made from recycled metal welding rod. Shown with 25W antique radio style incandescent bulb. 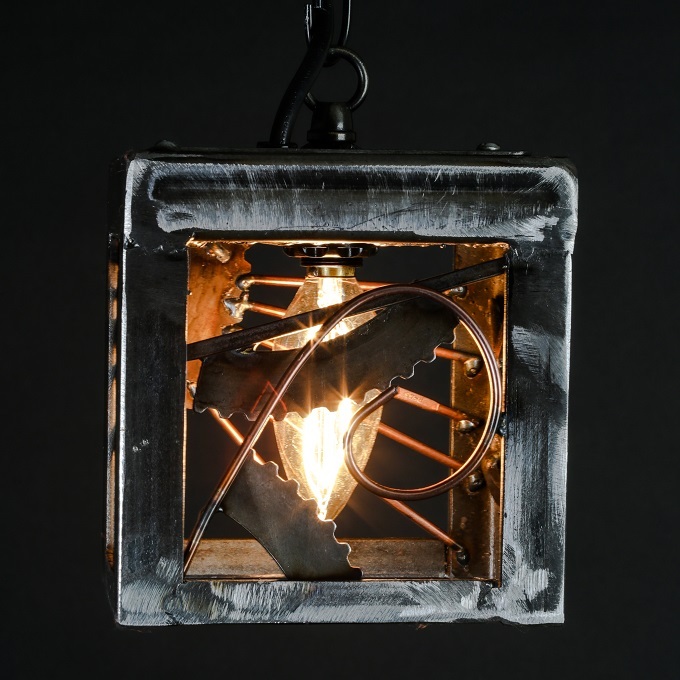 This edgy pendant light is made from our shop scraps, like left over clutch plate plates, welding rod and other bits. Shown with 25W candelabra bulb. 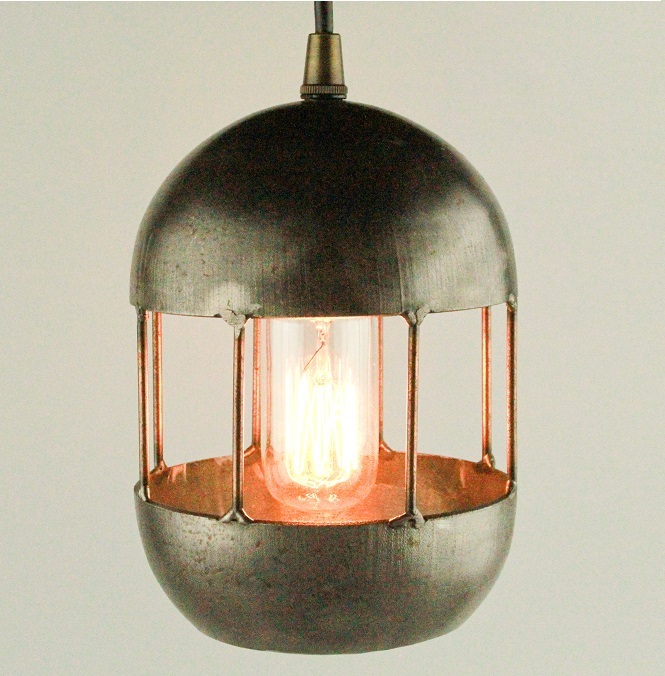 Our orb pendant light is made from metal sourced from the local scrap yard. Two inner structures are available ( inner orb and triangles)- Shown with inner orb. Our Mini Orb pendant is about 7" diameter and is shown in 2 different styles. One style is the atomic style and the other is the orb style. The atomic style shown in the first picture has a 12.5w incandescent while the orb style in the second picture is using a .5w LED bulb. 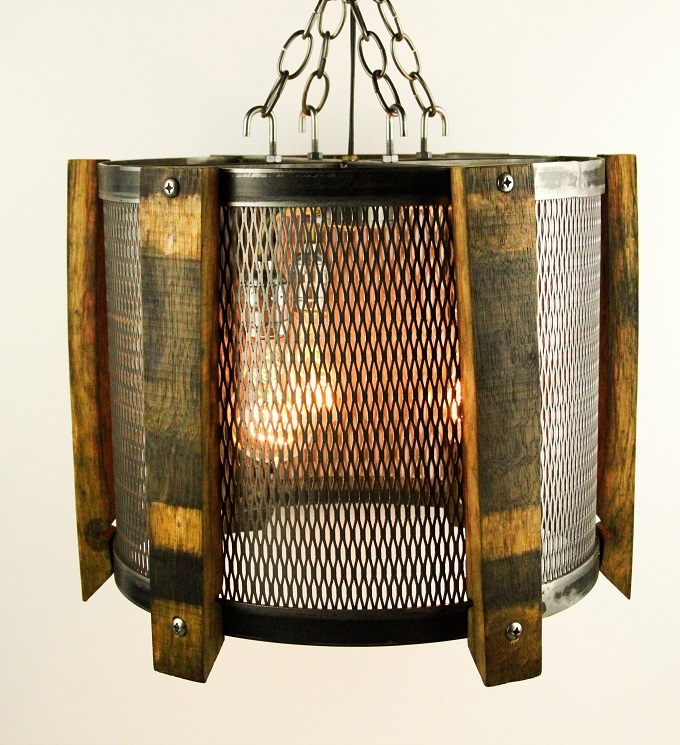 This 10" diameter chandelier is made from recycled pallet banding among other re-used metals. Comes with large 5" diameter antique filament bulb makes quite the conversation piece. 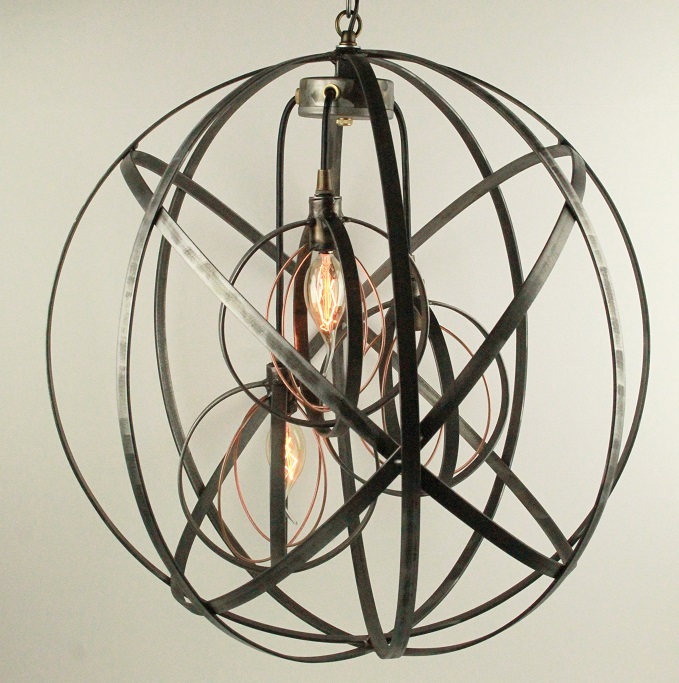 Our Orb chandelier with 3 inner mini-orbs is about 20" diameter. Shown with both .5w LEDs and 12.5w incandescent bulbs. 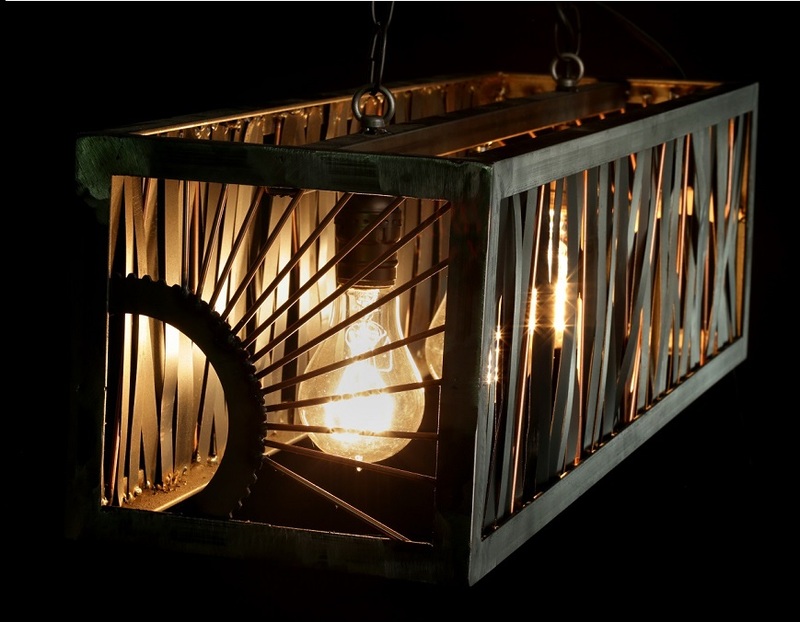 The Banding chandelier is made from recycled pallet banding among other metals as well. It's dimensions are 30" long, 8" wide and 8" across. Our wine barrel chandelier is a unique design inspired by wine barrel staves. The chandelier is roughly 16" diameter and 12" tall. This chandelier is like the wine barrel minus the wine staves. It's dimensions are 15" diameter and 12" tall.